1) Those who have followed the progress of Cholita Linda (4923 Telegraph Ave., Oakland) will be happy to know that the popular farmers’ market vendor (and purveyor of much-raved-about Baja-style fish tacos) has — finally! — softly opened its long-awaited brick-and-mortar restaurant in Temescal. Co-owner Murat Sozeri, whose wife Vanessa Chavez is the chef, told What the Fork that the restaurant opened last week with a limited menu consisting of just the four tacos that they sell at farmers’ markets. Chavez plans to add a couple of new dishes each week — first up, starting this past weekend, was picadillo, a dish featuring seasoned ground beef, olives, and raisins. Initially, Cholita Linda was mostly only open for lunch, but the restaurant just expanded its hours to include dinner service. Current hours are Tuesday to Thursday 11 a.m-3 p.m. and 5:30-9 p.m., Friday 5:30-10 p.m., and Saturday 11 a.m.-4 p.m. and 5:30-10 p.m.
Don't sleep on the "crōn’t" (via Facebook). 2) We’ve had imitation cronuts pop up in the East Bay every now and again, but now there’s finally a spot where you can get them on the regular. 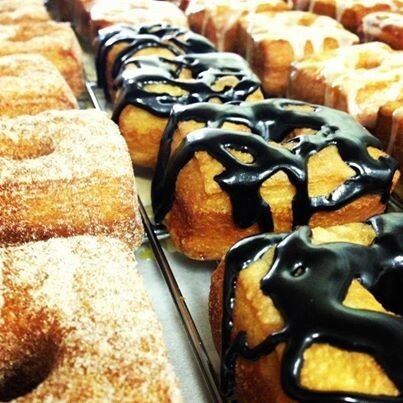 Donut Savant (1934 Broadway, Oakland), purveyor of deliciously adorable doughnut holes, is now selling a croissant-doughnut hybrid that owner Laurel Davis has dubbed the "crōn’t" (rhymes with “don’t”) almost every day, though Davis said she sometimes sells out quickly. Davis told What the Fork that the crōn’ts are closer in size to a standard doughnut and are priced at $2 each. She makes four different flavors: salted maple, vanilla glaze, cinnamon-sugar, and dark chocolate frosting. Insiders’ tip (subject to availability): You can request that any of the crōn’ts be filled to order with vanilla bean pastry cream. 3) Inside Scoop reports that the San Francisco-based brewery 21st Amendment, which has been doing its production in Minnesota for the past several years, is returning to its Bay Area roots: The company is building a gigantic, 95,000-square-foot brewing facility in San Leandro, at a former Kellogg Cereal factory building. The brewery and tasting room should open sometime in the fall; a restaurant with a beer garden component is planned for next year. 4) Food truck lovers, rejoice: Alameda is getting another big food pod event. Alameda Food Coma, a new food-truck pop-up that will take place every first and third Saturday of the month, kicks off on Saturday, March 1, from 11 a.m. to 3 p.m., at the College of Alameda (555 Ralph Appezzato Memorial Parkway). 5) Tablehopper reports that BBQ Hut (6400 Shattuck Ave.), a new barbecue joint in North Oakland, is now open, serving your standard array of Southern-style smoked-meat delights: ribs, brisket, chicken, sausage links, and so on. 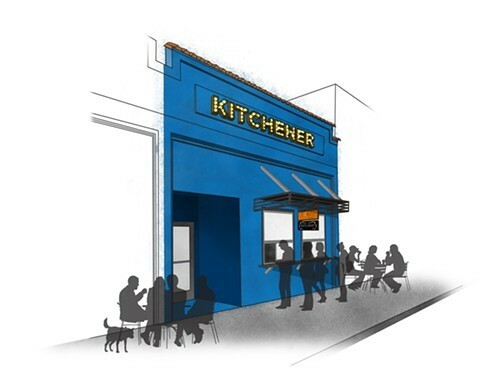 6) A quick update to my story on Kitchener Oakland’s innovative takeout window project: The Uptown commercial kitchen reached its $25,000 Kickstarter target with a few days to spare and is now making one last push to raise the rest of the estimated $30,000 that it needs to complete the project. 7) And one more quick follow-up: A couple of weeks ago, we reported that the Freedom Farmers Market had moved to 942 Stanford Avenue in North Oakland (the Grease Box parking lot), but it turns out the move was short-lived. Organizer Gail Myers recently announced that the Saturday farmers’ market is returning to its old spot at 3000 San Pablo Avenue for the time being, starting this Saturday, February 22. In the meantime, the market has launched an express “Freedom Bags & Boxes” program for customers who want to pre-order their produce. 8) Over in Kensington, Benchmark Pizzeria (1568 Oak View Ave.) recently expanded the non-pizza sections of its dinner menu to include more antipasti, seasonal dishes, and full entrées. 9) Berkeleyside Nosh profiled Justice Grace Vineyards, a social-justice-themed Berkeley winery with a focus on petite sirahs — and bottle labels that graphically illustrate the winemaker’s enthusiasm for such issues as a national living wage. 10) ICYMI, this week What the Fork offered a sneak peek at the menu of a new pho joint coming to North Oakland and looked at the Berkeley Student Food Collective’s efforts to bring farmers’ market produce to college students.